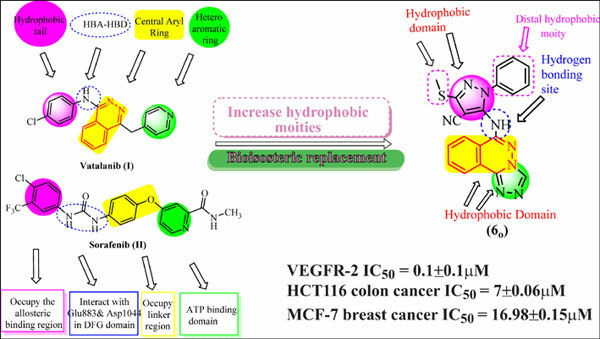 Background: Extensive studies were reported in the synthesis of several phthalazine derivatives as promising anticancer agents as potent VEGFR-2 inhibitors. Vatalanib (PTK787) was the first anilinophthalazine published derivative as a potent inhibitor of VEGFR. The discovery of vatalanib as a clinical candidate led to the design and synthesis of different anilinophthalazine derivatives as potent inhibitors for VEGFR-2. The objective of present research work is the synthesis of new agents with the same essential pharmacophoric features of the reported and clinically used VEGFR-2 inhibitors (e.g vatalanib and sorafenib). The main core of our molecular design rationale comprised bioisosteric modification strategies of VEGFR-2 inhibitors at four different positions. Material and Methods: A correlation between structure and biological activity of our designed phthalazines was established using molecular docking and VEGFR-2 kinase assay. Results and Discussion: In view of their expected anticancer activity, novel triazolo[3,4-a]phthalazine derivatives 5-6a-o and 3-substituted-bis([1,2,4]triazolo)[3,4-a:4',3'-c]phthalazines 9a-b were designed, synthesized and evaluated for their anti-proliferative activity against two human tumor cell lines HCT-116 human colon adenocarcinoma and MCF-7 breast cancer. It was found that, compound 6o the most potent derivative against both HCT116 and MCF-7 cancer cell lines. Compounds 6o, 6m, 6d and 9b showed the highest anticancer activities against HCT116 human colon adenocarcinoma with IC50 of 7±0.06, 13±0.11, 15±0.14 and 23±0.22 µM respectively while compounds 6o, 6d, 6a and 6n showed the highest anticancer activities against MCF-7 breast cancer with IC50 of 16.98±0.15, 18.2±0.17, 57.54±0.53 and 66.45±0.67 µM respectively. Sorafenib as a highly potent VEGFR-2 inhibitor was used as a reference drug with IC50 of 5.47±0.3 and 7.26±0.3 µM respectively. Nine compounds were further evaluated for their VEGFR-2 inhibitory activity. Compounds 6o, 6m, 6d and 9b emerged as the most active counterparts against VEGFR-2 with IC50 values of 0.1±0.01, 0.15±0.02, 0.28±0.03 and 0.38±0.04 µM, respectively comparable to that of sorafenib (IC50 = 0.1±0.02) µM. Furthermore, molecular docking studies were carried out for all synthesized compounds to investigate their binding pattern and predict their binding affinities towards VEGFR-2 active site. In silico ADMET studies were calculated for the tested compounds. Most of our designed compounds exhibited good ADMET profile. Conclusion: The obtained results showed that, the most active compounds could be useful as a template for future design, optimization, adaptation and investigation to produce more potent and selective VEGFR-2 inhibitors with higher anticancer analogs. Triazolo[3, 4-a] phthalazine, molecular docking, VEGFR-2 inhibitors, anticancer agents, vatalanib, anilinophthalazine derivatives.